I wrote the following yesterday: "Cameras have all gotten so 'good' that what's starting to emerge is a certain tyranny of sharp, clear, detailed, correct-color, adequate-DR digital images. It's not all the same equipment, but more and more it's the same, or a similar, aesthetic look." Richard Palmer emailed this morning to point out that Ralph Gibson addressed that very subject in a TEDx talk called "Finding a Visual Identity in the Digital Age." Indeed, at 2:53, Ralph says more or less the same thing I did: "...software is a key word here because it enables us all to take pictures very easily, and at the same time it makes everybody's pictures look the same." I'm not sure Ralph entirely answers the question about how to find your identity—not everyone's work is keyed to graphic issues such as shapes—but his talk is good to listen to all the same: it's certainly great to hear about his epiphany in the Navy, what he learned from (and about) Dorothea Lange, his catharsis about his mother in front of the New York City beauty parlor, and other big moments in his life. If you don't know Ralph Gibson, head to your local library and see if you can find copies of his Lustrum Press books The Somnambulist (1970), Déjà-vu (1973), and Days At Sea (1974) (you couldn't get away with that scandalous NSFW cover today!) to look through. Here's a short backgrounder on Lustrum Press, which he founded and ran. Many of his later books are just as good but weren't nearly so famous or influential. My own favorite book of his, for reasons I don't fully understand, was his first book in color, L'Histoire de France. San Warzoné: "It was obvious early on that Ralph Gibson's images were different...nowhere near the 'same' and certainly not 'MCU back of head with outdoorsy hat.' It was his choice of subjects that made them look so unique and attention grabbing. Being poor and living out of a suitcase didn't stop me from buying his 'Trilogy' in the bookstores along Polk Street back in the '70s, while living in San Francisco. Looking through those books was like going to school...eye opening, provocative, stimulating and direction changing...eyes open and head up." "Looking at many of his pictures you get the feeling that you could easily have made them yourselves. So what is so good about them? Soth is of course very much involved with his his subject. A more personal style (like Gibson or Adams) would have interfered with his story. "Technically perfect images can be extremely boring and ineffective when it comes to visual communication. In my career as graphic designer I have dealt with these problems so many times. There is always a need to make a difference. You always need something special for grabbing the attention. So if everybody shoots full color with the latest high-end DSLR you might steal the show with let’s say a twenty-five-year-old compact camera and pushed Tri-X. Good illustrations of this can be found at fashion magazines. Real professionals don't always go for the latest high tech. (Graphic designers have of course many more and heavier weapons to pimp boring images, a universe that expands far beyond Lightroom and Photoshop). "The 'MCU back of head with outdoorsy hat' series seems larger than the sum of parts. The cheerleader effect. Also reminded me of this great project [Exactitudes] of photographer Ari Versluis and profiler Ellie Uyttenbroek." Mike replies: Thanks for that. I'd been thinking of that project but I couldn't remember any of the names. It's really not good for my work to have most of my books in boxes. I need my working library! It's also fascinating to hear Alec Soth's thoughts about that picture, because it's what I always thought about it. It always seemed out of place to me in the book. Which I also have. Somewhere. I'm intending to take Saturday off, unless it's already too late for that. But I wanted to leave you with something to chew on for the weekend. I know from experience that you can sift through thousands of old snapshots and only find one or two that have this sort of magic. It's a beautiful photograph. It's made more poignant by the fate of the young woman in the picture. Her name is Win Mayer, and the cause of her death was "Attempt at criminal abortion, self-inflicted." It illustrates an article by her granddaughter that tells everything the younger woman has been able to find out about her laughing grandmother's grim fate. So many old photographs are essentially tragic, if we take the time to really think about them. A memorably beautiful, achingly sad picture, to me. "For many years my late husband, Gardner Botsford," she writes in the New York Review of Books, "kept a small black-and-white snapshot on his desk of a man and woman wearing shorts, walking one behind the other on a tennis court. I didn’t know who the couple were but assumed they were friends from Gardner’s life before our marriage, people he had been close to and fond of. One day I asked him who they were and he laughed and said he had no idea. He had plucked the picture from a pile of rejects on their way to the wastebasket. It had leaped out at him as an example of an outstandingly terrible snapshot, one that had everything the matter with it. The couple had their backs to the camera; the tennis court showed a few white lines; there were undifferentiated shrubs and trees edging one side of the asphalt. That was all. I saw what my husband saw and laughed with him. There was no reason for the existence of this picture. Keeping it was a wonderful exercise in absurdism." When she was writing in Diana & Nikon about a type of art photography that took the snapshot as inspiration, she couldn't resist the sly "in joke" of including Botsford's "outstandingly terrible" one as an illustration. The career of that photograph thus seems similar to David Letterman's early innovation of making stars out of stagehands and random ordinary people such as a local deli owner, and, especially, of his recurrent use of Calvert DeForest, a.k.a. "Larry 'Bud' Melman," whose significance on the program seemed to have a permeable membrane separating satirization (as the worst possible actor the producers could find, the main part of the joke), and real acting accomplishment and real celebrity for Larry Bud. DeForest, who did walk-ons for years and ended up having a good career being implicitly lampooned by Letterman, said that his introduction of the first episode of "Late Night"—a parody of the prologue to the Boris Karloff film Frankenstein—was "the greatest thing that had happened in my life." Poor guy. Poor guy—? Or lucky guy? I still don't know. I don't think we're meant to. Getting back to the ringer snapshot, there's a funny little coda, too, which you'll read about. I couldn't help but feel twinges of sympathy for Graham King (I have his book, in a box in the barn), who'd been had. Although King was right—all he claimed about it was that it had "been published." As it was. A short but neat little essay. Recommended, if you have the time this weekend. It seemed like synchronicity that I encountered these two old snapshots—one so deeply sincere, one so deeply ironic—in close succession. This is one photographic compulsion I seem to have completely escaped. I owned one wholly inadequate (but very expensive) camera bag for about 25 years; replacing it, I tried a few, quickly settled on the Tenba Large Messenger bag (now discontinued), and have remained perfectly happy with that. I just figure that bags are like tripods—they can't be optimized because they're fundamentally frustrating, in that they have at least two design parameters that are diametrically opposed. In the case of tripods, you want them to be conveniently tall and rock-solid when set up, but small, portable and lightweight when being transported. With bags, you want them to hold everything securely, yet also be small, featherweight, and wieldy (that's the opposite of unwieldy), and keep everything easily accessible. Ergo, I accept that I'm never going to be satisfied with any tripod or camera bag. Quixotically, this allows me to be perfectly sanguine about owning less than optimal examples of both breeds of products (although my tripod, a carbon fiber Gitzo, is wildly better than my ancient all-metal one. And, come to think, my Tenba is much better than my yeoman Billingham bought during the Reagan Administration, too). Avo Koplimae: "Back in the mists of time, I recall a camera store clerk helping me with the purchase of a tripod. He explained that there were three desirable qualities to look for. A tripod should be sturdy, lightweight, and inexpensive and that I could have any two of those choices. I certainly haven't been able to disprove that statement in all these years." Doug Thacker: "Avo, that could have been me you talked to. That's exactly what I used to tell all my tripod-shopping customers when I worked in a camera store. And it's still true today, as Mike points out with his own tripod. The nice thing about tripods, though, is that if you buy right, you might only have to buy once. There aren't too many things you can say that about. "I used to have a closet full of camera bags. Backpacks, waistpacks, messenger bags, shoulder bags, you name it. I even tried my hand at my own design, with the intention of having it made. About four years ago, I discovered the Lowepro Passport Sling, and that's the only bag I've needed ever since. The Lowepro Sling combines the best features of a backpack, a messenger bag, and a shoulder bag, and there's not much you could do to improve on it. It has two padded compartments—I usually put a camera in each—as well as a large, unpadded space. I often have an additional lens or two inside this space, each of them in its own padded Lowepro lens case. The bag can also be expanded by unzipping it in front, but I almost never have to do do that. Without expanding it, the Sling holds two XT bodies, each with a lens attached, two additional lenses, each in its own case, a Ricoh GR, and enough extra batteries and cards to get through a full day of shooting. It's not perfect, but it's the closest thing to perfect I've yet found in a bag." Marc Lawrence: "Some years ago, early in my photography obsession, I bought a Lowepro backback, and I can't argue that it is a very good, well-built photography backpack, probably. But I never, or rarely, used it. I do now—it perfectly holds a Nespresso coffee machine, frother and coffee supplies when we go roadtripping, because I need my first-thing-in-the-morning latte (it’s okay, I hate myself a little bit too). I just bought my partner a drone camera backpack from Lowepro—I wonder if it might hold an icecream maker and waffle grill...?" MikeR: "This made me laugh! Just last night I surveyed my own collection of compromises, and re-activated a Lowepro Slingshot 100 that has been empty for at least six years. And of tripods, I have a few, including a carbon fiber Manfrotto, which I love, but rarely use cause it's such a beast to carry around. My latest object of covetousness is a Benro 'footed' monopod with a video head. Thank you for putting into words the conundrum of tripods and bags." Eolake: "I also have a carbon fibre Manfrotto. I agree, it’s amazing. The weight difference from my old metal Manfrotto is startling." Mike replies: I think this is the one I have. I have to admit it almost destroys my "opposing parameters" theory because it's both very light, and tall and sturdy as well. Good thing, because I tend to keep my tripods for 30 years. It doesn't break Avo K.'s adage, though. Curt Gerston: "Thank you Mike. Very wise words...but where was this post 17 bags ago?" Gordon Lewis: "On the other hand, there is no law that says you can only have one tripod or camera bag. I have a large, super-sturdy tripod I use for home studio work and a very portable tabletop tripod I use for travel. Same with bags: Big padded bag to protect equipment during rough transport vs. small, lightly padded shoulder bag for street shooting." Greg Heins: "This is often overlooked, but the camera bag to tripod (includes monopods) ratio is crucial. It is best kept at or near 1:1. By means of some judicious pruning, I’m right there with about a half-dozen of each. When the ratio goes awry, your photographs suffer. As I say, often overlooked...."
Mike replies: Dual-purpose rationalization. Efficient. I like it. Mark Kinsman: "I have the perfect messenger bag...it only needs to be a few inches taller and wider to be even more perfect. Oh, and a little lighter too. Actually that’s true of all 11 bags and backpacks I own." Airplane: one camera bag plus a smaller satchel for walking about. Walking in NYC with an 8x10: a Dolt backpack strapped to a folding handtruck. "Oh, and bungees. Lots of bungees. Don't get me started on tripods. My rule: the largest possible, given the circumstances. For travel, a mini Manfrotto. For home: a maxi Reis. And everything in between. I have swooned for carbon, but settled for aluminum." Ian [who sent me the link —MJ]: "What made this even funnier was I had just agonised over a non-camera backpack, to replace one I bought at the turn of the millennium." This is a pretty involved story, but if you've ever been a professional photographer you will be sucked into it with a mixture of horror and fascination. And probably some level of familiarity. The vindictive wedding clients deliberately ruined the reputation of wedding photographer Andrea Polito of Dallas, Texas, with an Internet and social media campaign that advanced an easy but false narrative. Andrea's prospering business withered and she was forced to close her studio. But Andrea got the last word when a jury awarded her more than a million dollars in judgement, finding that the couple, Andrew and Neely Moldovan, were guilty of malicious defamation. As with many such judgements, Andrea might never collect, but at least the truth is out now, and known to the world. toto: "Some bloggers will try and ruin other people just to attract readers. (TOP not included, of course) Here's another case." Mike replies: Great link, but it seems like that's a case of a blogger/photowriter (Gary Fong) coming to the aid of a persecuted photographer (Nelson Tang). The villain in that case was a lawyer/client. The June 5 & 12 issue of The New Yorker features a long "Reporter at Large" article by Margaret Talbot called "The Addicts Next Door: West Virginians fighting to save opioid abusers—and their town—from destruction." It's a long, engrossing article, if one that's difficult to read. The article includes a series of mini-profiles of a number of people, and one of the first ones featured is Lori Swadley, a successful wedding, portrait and boudoir photographer from the Martinsburg, West Virginia area. Despite obviously having lots else to do, Lori started an Instagram series called "52 Addicts." Lori says in The New Yorker story that she herself was inspired by a reporter named Jenni Vincent, whose byline was on many of the stories about overdose deaths in The Martinsburg Journal online. "You could tell she wanted the problem to be known," Lori told Margaret Talbot. "Because at that time it seemed like everybody else wanted to hide it. And, to me, that seemed like the worst thing you could do." That took me back to my son's first girlfriend, a bright, personable 14-year-old named Katelyn who I know I'll never be able to forget. Despite a loving mother (we didn't know her dad), Katelyn died of an overdose at 20—and there was no mention anywhere of how she died. I spoke to Lori on Saturday, and she said she wondered when she was talking to the reporter whether there would be any negative blowback for her business, but she's found that all the responses to the work and the publicity have been positive. Great admiration to Lori for taking on her "sideline" project for the sake of transparency and honesty and to honor those among her neighbors and her community who are struggling against the epidemic. Random Excellence = excellence randomly encountered. Presidential administrations often become known by a few iconic photographs—Dirck Halstead's picture of Bill Clinton hugging Monica Lewinsky at a Democratic fundraiser; George W. Bush affecting a military uniform (always a blunder, as it ignores an essential principle of American democracy) underneath the infamous "Mission Accomplished" banner. Doug Mills may have taken the first such picture of the Trump administration—former FBI Director James Comey testifying in an unusually crowded "216 Hart" (Room 216 of the Hart Senate Office Building). How did he do it? Here's an interview with Doug that includes a description of how he set up and even a picture of himself taking the now-famous picture, captured by one of his own remote cameras. Stephen Voss: "A great shot, and the best application of a technique Doug has employed a few times previously. Here's one. But I think the larger takeaway here is less about method and more about his thinking in why this would be the right moment for this kind of shot—that's what makes Doug such a great photographer. 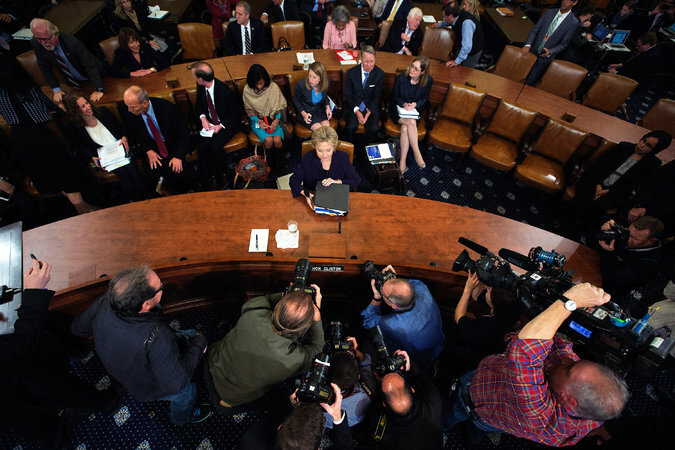 Tangentially, I also was photographing that day and it was one of the most crowded hearings I'd ever been to." Mike replies: Wow, your lead is a great shot too. Mike Shwarts: "Interesting, but he might want to switch to an Olympus Micro 4/3 and Android phone with the Olympus Share app. You put the phone in a bicycle mount that you attach to the monopod. Then you have a live view and the phone can trip the shutter. I've been doing this lately for a different point of view for static displays at air shows. Takes the guess work out getting the composition correct. "I think phone remotes with live view that can be used on DSLRs are being developed through Kickstarter." We've covered the story of wildlife models and photography game farms before, but Quartz's authors and photographers do a thorough job of presenting the issue in a new article called "Love wildlife photos? There’s a good chance they weren’t shot in the wild." The "window-shade" illustrations are a nice touch too. Well done. And yes, whenever humans are responsible for animals, there will be a range in the animals' treatment from ethical and humane to cruel and atrocious. I'm sure not every photo-game-farm wolf, fox, buffalo or cougar is well cared for. But it's not inherently a crime for animals to work for their keep, and all in all I'd rather have them posing to be shot with long-lensed Canons than with high-powered rifles. As for the photographic results, well, we're learning to be skeptical, aren't we? Listen to what the human photographer says about any picture, and decide whether you want to trust what that person says about what you're looking at. Photographs don't lie; only photographers do. And then only sometimes. Meanwhile, back at the ranch, here at TOP rural HQ we're trying to be courteous to the mother robins who have built their nests under the eaves of the pavilion out back. At first, the dogs coming out the back door would scare them out of the nests and into diversionary tactics; but now they've learned that the canines down on the ground won't hurt them, and they sit there impassively, eyeing all three of us. I try to move slowly and stay out from under the pavilion roof. My first Spring in this house I tried to dissuade the robins from building their nests on the patio, but robins are bloody-minded in their determination to build their nests where they want to build them: nothing will make them change their minds. So I figure we'll just do our best not to bother them until the hatchlings strike out on their own. It's not so bad. I feel a part of the project, in a small way. The robins' nests with the mothers gone. It doesn't make for much of a picture, but I don't like to disturb them when they're at home egg-sitting. Back to the photo game farms: I suppose they're harmless, all things considered. I know the subject is controversial, and any judgement I might make about about it open to challenge and criticism. But it doesn't matter what I think anyway. Different people have different feelings about animals and that's just the way it's always going to be. Check out the article and see what you think. Ken: "To me, as both a nature lover and an amateur photographer, the biggest thrill of photographing wildlife is the experience of encountering and seeing the animals in their natural environments. Any pictures I get are bonus." Dennis: "I have no conceptual problem with well run game farms or with photographers using them. I'm sure many specific game farms are problematic. But to me, it isn't wildlife photography; it's closer to zoo photography—maybe somewhere along a sliding scale—and as a result, ends up being something I'm just not that interested in. "A picture of an animal is a picture of an animal; in and of itself, rarely exceptional as a two-dimensional image. Context is everything. It's not a particular arrangement of form and color that makes us react to a mountain lion cub one way or a snarling grizzly another. Wildlife photos rarely stand on their own as art; they're usually accompanied by some text that provides context. Captions at least or maybe a whole story. Without that, they're postcard pics. "Ctein once argued on this blog that nobody cares how hard you worked to get the picture and there's obviously truth to that, but I think that with wildlife photography, viewers appreciate knowing that they're looking at something that was difficult to get. I know that reading about how Greg DuToit obtained his 'lion at watering hole' images made me appreciate them more. I looked into a wolf preserve while vacationing in Colorado last year, but my daughter wasn't quite old enough to join us in a 'work encounter' package. Maybe on a return trip. But I had little interest in actually photographing the animals. I'll take a mediocre photograph of an animal that I legitimately encountered in the wild over an excellent photograph of a captive animal any time. (Just like I prefer shooting candids over posed portraits). They're different 'animals' and to each his own." Miserere: "I strongly object to these wildlife farms, in the same way I object to photographers using model agencies. If you want to photograph a human, book a safari to the nearest concrete jungle and take your chances. That human beings sell themselves and allow to be photographed in exchange for money is disturbing and inhumane (I mean, have you seen the lankiness of those human models? Clearly they're not being fed enough!)." Mike replies: What an interesting opinion. And one I've never heard before, which doesn't happen often with photographic subjects. Dave Elden: "Re robins: I have a nest in a similar location that I can watch from my desk. I am very happy to see the birds there because of the way they chase the squirrels off—a squirrel being chased by a robin hasn't got time to chew anything it I don't want it to! Plus the entertainment value of the chases is considerable. Robins, a sign of spring here in Ottawa—although it's snowing right now on top of extensive flooding." Daniel: "Don't really have a problem with those using handlers and game farm animals. What I do have a problem with is these photographers failing to label the images as captive/tame animals. Many of these photographers try to pass off the set up with tame animals as 'Wildlife' rather than quasi-zoo shots. At least places like Yellowstone, Ding Darling refuge and so many where photographers photograph the same semi-tame animals over and over are 'in the wild' without a handler. Animals so used to people that you can photograph with a normal lens at times—but still 'in the wild' as they are not being driven to a location and a handler helping manage the animal for the image. "If you photograph it, label it correctly." Longtime TOP reader Stephen Voss, a photographer who lives and works in Washington DC, has been "documenting the upheaval and psychological tumult of the Trump Administration here in DC on both a local and federal level," as he says, and now has a major portfolio published at Politico. Politico's introduction: "For anyone who lives in Washington, it was clear Donald Trump campaigned against the city in two ways. He ran against 'Washington,' the metaphorical seat of unchecked government power, and also against the actual city of Washington, a multicultural, Democratic stronghold that embraces immigration, marijuana and seemingly every other progressive policy Trump voters rejected. Since the inauguration, photographer Stephen Voss has been documenting the city’s uneasy relationship with its highest-profile new resident." Outstanding documentary photojournalism, well worth taking a look from a photographic perspective regardless of your politics. Big congratulations to Stephen. I make plugs here about the wide-ranging and far-flung photographic content at The New York Times, but TIME Lightbox also does a nice job. I got in the habit of ignoring them because early on I couldn't access them: some glitch in the Tubes of the Interwebs somewhere made it so the front page would open and then get stuck. So if I saw a link to TIME Lightbox I would ignore it. No need now. Whatever was broke is fixed. And it's a good source for excellent, thought-provoking, eye-gratifying, mojo-revivifying slideshows. Consider these two: Richard Sandler, written about by Alexandra Genova, and Charalampos "Harry" Kydonakis, written about by Gus Powell. Harry Kydonakis is from the Greek island of Crete (home of the Minotaur and birthplace of Zeus) at the southern edge of the Aegean Sea. He's known as "Dirty Harrry" [sic] online, and a search will yield many breadcrumb-trails to follow if you're so inclined. Richard Sandler, who is currently a videographer, has been getting increasing amounts of attention stemming from a book of his classic street photography done in the 1980s and early '90s, mostly in New York City. There is more of his work at his website. Stout stuff, both. Drink it in. Kenneth Tanaka: "Very compelling work samples by both Kydonakis and Sandler. Most interesting to me is the contrast in their styles of choices and presentation. Sandler's work reminds me a bit of Bruce Davidson's style, perhaps because of those trashed subway scenes. Kydonakis's work is much looser, not as generally figuratively impactful as Sandler's but much more conceptual. At least that's my take. Thanks Mike." Four the fourth year in a row, LensVid has published its excellent summary of the camera market, upon which we have all come to rely. For today, just a link to the video. All the information is in the video, and it's not too long. News this year, although no surprise, is as bad as any of us feared. Note, however, the kernal of admittedly selfish hope: more of the action in the camera industry is going to be in higher-end and professional products...in other words, just the sorts of things that most interest a lot of us. Here's LensVid's outstanding chart for this year, if you don't have time for the video. I'll have more thoughts about this in the days to come, no doubt, but all in good time. Oh, and @LensVid...thanks for this. I had to look into it because paintings like this have a tendency to annoy me—painted in 1825, it's clearly a fastidious copy of the image in a camera obscura. It even reproduces, somewhat, the tonal qualities and slightly faded colors of a lens image on a groundglass. Although that must have been a sensational and cutting edge technique at the time, presaging the shock of reality that representational photography was soon to make on the consciousness of the world, it's just another example of photorealism now. Albeit a pleasant and historically significant one, particularly if you are Danish. Isn't it beautiful? But it's not how people see; it's how a lens sees. That's not lens vision, although we can possibly imagine a model striking that pose in the studio as the painter paints by eye. Friedrich proves that an experience of the capital-“S” Sublime—the idea of malign beauty, then in vogue—doesn’t require a storm in the Alps. It needs only a sense of external reality that is not other to the self but, rather, otherizing. Variants of the effect abound in the arts of the past two centuries. It is cranked up to a steady state of panic in Kafka. It is becalmed but ubiquitous in Edward Hopper. Most of all, it has engaged innumerable photographers and filmmakers. Take Robert Frank’s classic, devastating shot of gauzy curtains blowing in a window that overlooks a grimy mining town: the good news of beauty laced with the bad news of being stuck in Butte, Montana. Come to think of it, any camera might function as an inanimate avatar of Friedrich—analogous to a brain being invaded wholly, exclusive of thought, by the uncanniness of the not-oneself. Isn't that great? Cranked up to a steady state of panic in Kafka, becalmed but ubiquitous in Edward Hopper. Nailed that. Makes me want to go immerse myself in Caspar David Friedrich's work, for one thing. Might be appropriate as I soldier on with Melville! Chris Y: "All that, and gotta love the lucidity of Peter Schjeldahl—this from a review of Richard Prince’s Instagrams in 2014—'Possible cogent responses to the show include naughty delight and sincere abhorrence. My own was something like a wish to be dead—which, say what you want about it, is the surest defense against assaults of postmodernist attitude.' You can’t really forget a line like that…." David Dyer-Bennet: "I kind of love the idea of a color photo from 1825! We don't get to see the objective photographic view of what happened that long ago very often. Of course, we don't know that the painter didn't in fact alter things. It was pre-Photoshop, but not pre-Artist, and artists are always suspect :-) ." "Just a few weeks back I stumbled into a Caspar David Friedrich moment on an outing and couldn't resist this selfie called 'Was nun, Caspar?' [What now, Caspar?]" Andrew Molitor: "When I see a reference to Frank's picture of Butte, I always check to see if the writer has really looked at the picture. Nobody ever seems to mention that the mine headframe in the distance appears to be engulfed in flame. "Well, it's probably steam, but it's still dramatic as hell. That photo has always struck me as a guy seeing something dramatic out his window, and shooting it with the far-to-wide lens he has mounted. The white-engulfed headframe in the distance is the beating heart of the picture, even so small. It's graphically important, as well as, to my eye, the obvious 'subject.' But people always drone on about the dreary town and the curtains." • First, the Hasselblad X1D is at long last showing up in the wild! Here's a post at GetDPI from "ddanois" that shows his. • Second, Hasselblad is now Chinese. Well, not really. But the Chinese drone king DJI has apparently bought a majority stake. TechCrunch asks, "Will DJI leave the business of Hasselblad to operate like an independent subsidiary, but continue to ensure its cameras are easily integrated with DJI’s drone rigs? Or will DJI use Hasselblad technology to entirely replace the cameras used in their consumer-level drones like the Phantom and Mavic?" Pentax 645D and Hasselblad X1D. Illustration courtesy camerasize.com. The answer isn't known, but when DJI took a minority stake (along with a seat on the Board of Directors) in Hasselblad in 2015, both companies said they would keep their operations independent. Struan (partial comment): "I think it's a mistake to see this tie-in in terms of putting Hasselblads into consumer toys. "Drones are already taking over professional aerial and mast-based photography, and new uses for top-down and oblique imagery are under vigourous development everywhere. Mapping cameras and photogrammetry have always used the highest resolution possible, because even the very best photographic tools and analyses are a small part of the overall financial and opportunity cost of getting into the air. National mapping and reconnaissance agencies won't be dumping their Leica Geosystems kit, but there plenty of civilian applications where savings on, say, helicopter time are so dramatic that what hobbyists think of as the high price of a medium-format camera is actually a drop in the bucket. "There are already companies here in Europe here offering farmers remote sensing-style analysis of drone footage of their crops. The results used to program and control GPS-aware fertiliser spreaders and harvesters. In this kind of application, medium-format imagers don't just provide better spatial resolution, their better spectral resolution aids image analysis too. "So to me, the DJI tie-in makes perfect sense. Hasselblad get a cash-rich owner/investor that is actually interested in cameras. DJI brings in-house the products, expertise and technology it needs for developing non-commodity drone applications. Win-win. I'm just hoping the some of the crumbs from the table fall into my lap." Jay: "I know it wasn't the main subject of this post but thank you for acknowledging the struggles immigrants face every day. It is unfortunate that so few people make an effort to understand what the true lives of immigrants are like."